So far, I have been alternating between 2 different churches. The first is a church on campus called International Bible Fellowship, which has a white pastor, and a contemporary service. The second church is called Flood, with a Malawian pastor who wears jeans, and is a representation of the youthful Christians in the country. But this Sunday morning, I decided it was high-time I visit the local Anglican church in Lilongwe. Here’s the story of my second, blog-worthy, bonehead move during my time in Africa. There were just a few problems with this plan. A) I’ve never driven stick shift before. B) I’ve never driven a car where the steering wheel is on the right hand side. C) I’ve never driven on the left-hand side of the road. D) And I’ve never driven on the congested streets of Lilongwe. On no level was this a good idea. But I backed out the car, started driving, and all of a sudden we found ourselves coasting along on the busy streets of Lilongwe. Cars were whizzing by me on the right, and a cluster of pedestrians and bicyclists crowded the shoulder on the left. But things were looking good. We kept finding the corresponding landmarks, and eventually arrived at the street the church was supposed to be on. We had no idea what the name of the church was or what the building might look like. But I assumed everything would be clearly marked, just like in America. We passed some police officers on duty, along with a few other unimportant landmarks, and then came to the end of the road. This dead-end verified that we had missed the church, and so I had to turn us around. On the way back, Woody saw a green sign with the word “Christ” on it and suggested that we turn in. It was clear that we were still in the wrong place, so we continued to drive through the parking lot until we reached the other exit back onto the streets. The car stalled out several times in that lot, and one of the aforementioned cops began walking toward us in suspicion. Once he was close enough, he put his hand up, signaling us to stop and pull over. My window was down, and I had two primary thoughts running through my head: “I don’t want to be late for church” and “Man, it would be slightly inconvenient to be stopped by the police right now.” So…I waved at the officer, energetically shouted, “Hi! how’s it going! ?” and kept driving. It was a very short-sighted plan. As soon as I got to the exit of the parking lot, our car was surrounded by cops, and in plain English they barked “Why didn’t you stop back there!” I parked the car, one of the cops came to my window, reached in, yanked the keys out of the ignition, and walked away. The cop who originally waved (his name was Sebastian), came over and interrogated me for my delinquent behavior. I conjured up every excuse I could think of, and even Woody chimed in confessing to be my driving instructor (which was an explanation for why our car stalled out so often). Not much time passed before they demanded my license. But, while working at Enterprise, I developed the bad habit of never taking my license with me because I hate having stuff in my pockets. He told me to call someone and have them bring it. “I’ve got no one to call” was my counter. Sebastian then threatened to seize our car while we take a mini-bus home to go get the license. I told him I wasn’t going to let them do that, and he finally walked away to confer with his buddies. I took the opportunity to call Kellen, the mapmaker, and ask for his advice. He said he would get my license for me and drive out to us. I hung up the phone and Sebastian came back to the window. He told Woody to get out and sit in the back so he could take a seat next to me on the passenger side. He handed me the keys and told me to drive the car to the police station. I looked him in the eye and sternly said, “No. I’m not going to do that.” For some reason, Sebastian’s demeanor softened after that. He began to ask us why we were scared. This is where Dani, the only female present, chimed in. She kindly explained to him that it would be scary to be stopped by the police when you’re in a different country. I put the keys in my pocket, got out of the car, and walked towards the street. Meanwhile, Dani and Woddy continued to soften him up. I called Kellen, gave him specific instructions on our location, and he arrived within 2 minutes. He got out of his SUV with a big smile, which told me that he both understood and sympathized with our situation. After Kellen presented my license to the officers, we were still asked to pay our fines at the police station. But I felt better about going now that Kellen would be accompanying us. 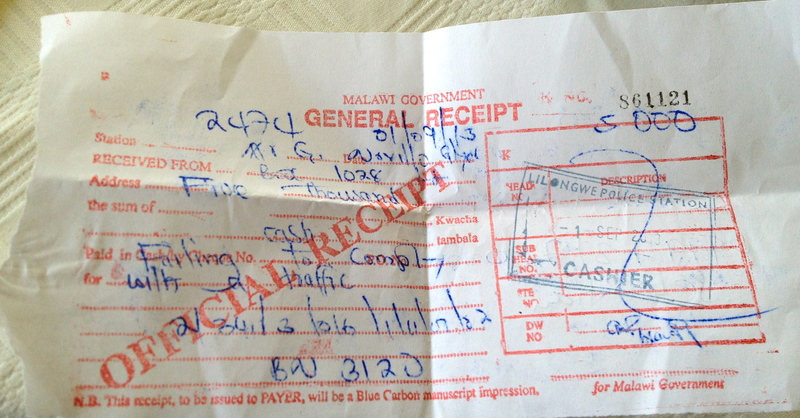 I was fined 5,000 Kwacha ($15 USD) for “Failure to Comply.” In the past, I’ve had the reputation that I can talk my way out of anything. But I think there’s a persuasive case to be made that I talked my way into this one. We never made it to the Anglican service, and I still have no idea where the church is. But we were able to make the Flood service about 35 minutes late, which is practically on time for Malawi. Afterwards, the three of us went out to lunch with some locals and they all exchanged similar stories involving the traffic police. Next time, I’ll be sure to bring my license. This entry was posted in Malawi on September 1, 2013 by Gret Glyer. Don’t let your sense of entitlement get you killed! I hear ya. It was a learning experience! Nah – I’ll refrain from watching till I’m safely back in the States. Thanks for the advice. Unfortunately, there aren’t any taxis and the minibus is hardly a safe option. They cram them full of people, the drivers drive like maniacs, there aren’t any seat belts, and a lot of the time the doors don’t even fully shut. 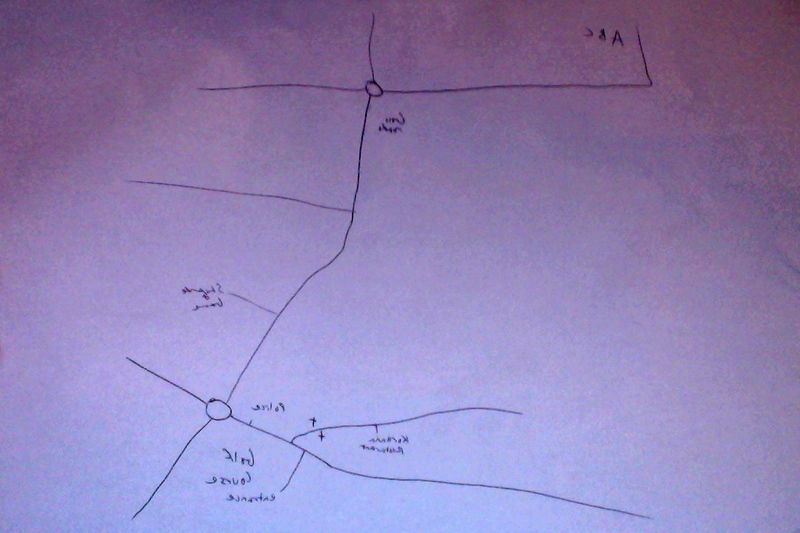 But I have much more reliable directions now, and I will do my best to drive the automatic transmission car next time.